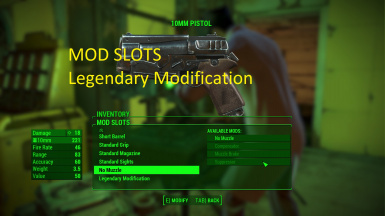 Does this mod make everything able to become legendary? No, it depend on the armor/clothes or weapon. Does it work with other armor mod? Yes, it doesn't makes change to any armor and this file is not an armor mod. -Some mod have restriction, the right part of armor will make it show as it was intended for that piece by the game. -You are using a Armor mod that doesn't ENABLE the legendary attribute with their armor. I cannot fix it, for it is their Armor MOD. The workbench menu is not showing up!?! How many mod do you have active? I have over 40+ mods and it take a while for the game to "background" load it to appear, so just wait for the workbench to load it up. This apply to all of your other mod too. Will not be consider "Legendary Featured Item" but will work! In some rare case it happen with other mod or just you but i will try my best to fix it. Make sure you are not missing any MASTER files! Patches REQUIRE another master file! I will not do any compatibility patch with any other armor/outfit mod. Having the right legendary is already powerful, having 2 legendary is already overpower/gamebreaking (hence it is optional file), but having 2 legendary for all of the clothes/outfit with armor piece will be too much (Outfit and armor piece can be use together) . Most I did is make it vanilla outfit able to have 2 legendary (Will not WORK with other ARMOR MOD). Either outfit (see my other mod) or armor piece with 2 legendary (Most likely to work with all outfit/clothes mod). If you want to make one go ahead, but I will not host it here on this mod. Hispanohablantes, debido a problemas de tiempo en mi vida personal y laboral, no podré hacerme cargo de la traducción al español de este mod. Podéis, sin embargo, descargaros las versiones antiguas de este mod, traducidas al español, desde la pestaña Files. It says missing masters for Legendary Modifications compatibility patch. It requires anymodanyweapon.esp instead of this anymodanyweapon2.esp which is the latest version plugin. how do i change dificulty? 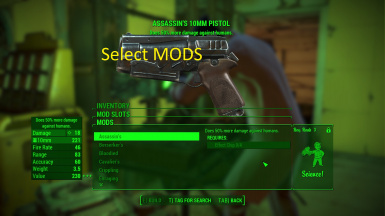 Is it possible to make 2LM for mod weapons? Yes. You can edit the mod directly, or you can make a separate patch. You need to add the keyword "ap_Legendary2" to the "Attach Parent Slots". Works on armor too. Do you have any experience with FO4Edit? 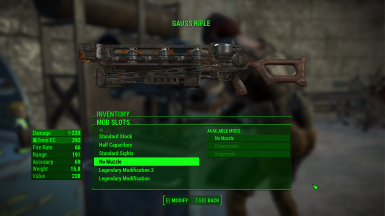 My mod Legendary Crafting Framework works with any kind of weapon and/or armour whether it's from the vanilla game or added by a mod. No patches or manual edits required. Everything is included right off the bat. 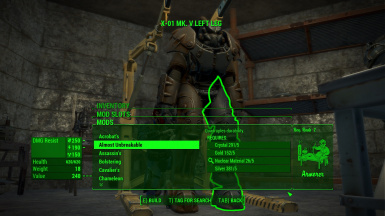 any one know how to do something i am sure its a option from this mod but some how i cant get it to work on a X-02 PA , no problem adding 2nd legendary on my power armors up to and including the X-01 but the X-02 only has 1 legendary slot. Is this mod still supported? I was thinking of installing it but reading the comments I find nothing but bug reports and overall gripes with it. There's a DLC/Fixes mod for this. If you don't want the "crafting UI bloat" that AWKCR brings, you're fresh out of luck - because the patch requires AWKCR. try opting for VIS-G Legendary Modifications. created by a very trusted and experienced mod author of this site. 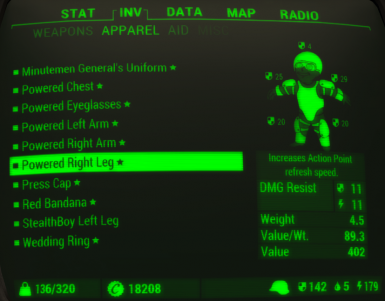 i've never used Legendary Modification before but went straight away to use the above one just to see how stable it is. oh, it's very stable. The mod works fine, people simply use these posts to ask for help. The update & DLC mod doesn't require AWKCR, that's author error. Easy enough fix in xEdit, which I posted there. 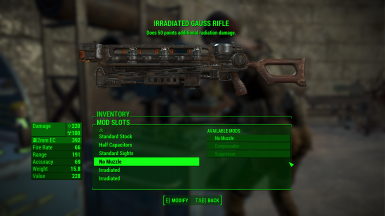 The mod works as far as adding/removing legendary effects. However if you want to use the part where you can scrap legendary pieces for material to make legendary mods, I never could get that working. I tried reinstalling the mod everytime on each difficulty, and then did the same again once i downloaded the other mod that is a patch for this one. To anyone reading save yourself the headache and just get VIS-G mentioned above. 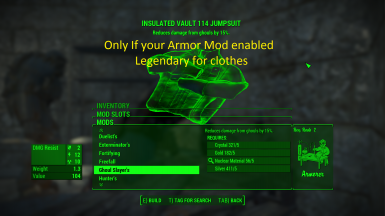 Why is it that the only legendary mod that is appearing is the grognak one? Cheat version of the mod doesn't work.